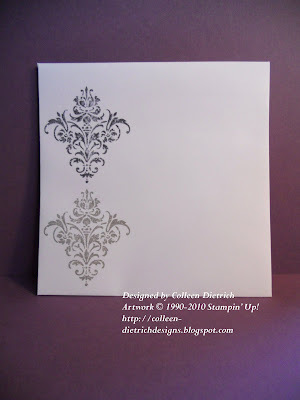 I absolutely love anything with a damask design. Before my grandmother passed away, she let me pick out some sumptuous damask tablecloths and napkins that she had either: 1) never used or 2) managed to wash with magic detergent. They were in impeccable condition. One set is golden yellow, one is soft pink, and a pack of napkins are baby blue (or if you think in terms of Stampin' Up! 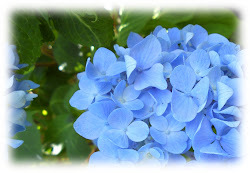 colors, they're So Saffron, Pretty in Pink, and Bashful Blue). I was thrilled to inherit these beauties. Which brings me to my card. I like to take my inspiration from unlikely places, and today's card was inspired by a shirt worn by, I believe, Meredith Vieira of the Today Show. A couple of days ago, I saw her wearing a pink shirt that had a light gray damask design on it. (At least, I think it was her...it could've been elsewhere) Instantly, I thought: CARD! For as much as I love damask, I really don't have too many stamps like that. This design is a stamp from the "Friends 24-7" set by Stampin' Up!. 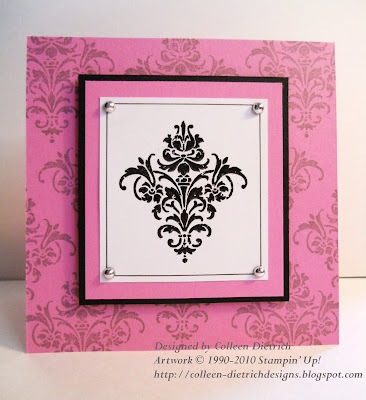 I used my Stampamajig to help me get an all-over design on the pink card layer. Simple matting in black, pink and white was all that was needed. I did heat emboss the main image with black embossing powder, but you can't see that from the photo. I used my SU black journaling pen to help draw a frame around the main image, and darn it - it smudged! That's okay...it was a happy accident. :) I wound up covering the corner smudges with silver half pearls. My envelope, using two grays: Basic Gray and Going Gray, both by SU. Thanks for joining me today and bearing with me while I spout about damask! Gorgeous, Colleen. I don't use this set nearly enough! I love this Colleen and know that I have picked up some inspiration from viewing it. It's dazzling. Oh, it's so much fun to read about your inspiration!! 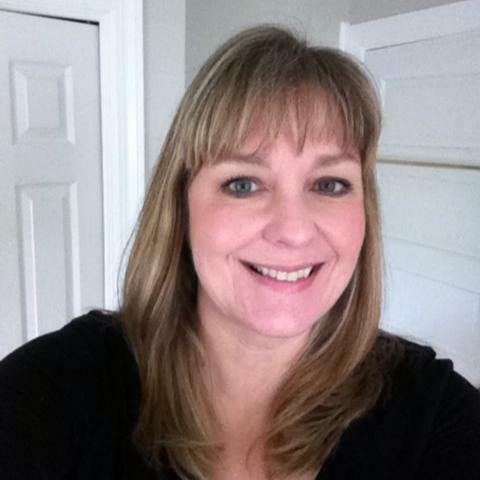 Thanks so much for sharing--about your smudges, too :) Glad to know that it's not just me!! !